LG V10's ticker display: Gimmick or useful? According to stats analyzed by Google itself, the average smartphone user unlocks their smartphone 100 times a day. That's a lot of disruption to its rest time, and has a negative impact on battery life — even if you just take a quick peek. 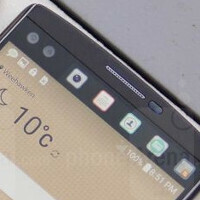 In that context, the secondary, 'ticker' display of the new LG V10 makes some sense. The 2.1-incher (160 x 1040 pixels, or 513 ppi in case you care) will push notifications (icon only, though) and show the time or weather when the primary, 5.7-inch panel is off, potentially saving you some battery — despite the 5% battery overhead it adds, according to LG. It'll automatically shut down when the phone is in your pants, too. The screen will also serve as a questionably handy shortcut base for quick (?) access to your favorite apps or contacts. Obviously, its position at the very top of what is a very tall device is less than ideal for that latter use case. In all, the secondary display of the V10 is of questionable utility, and it won't be until we get our hands on it that we'll know for sure which one it is. Still, based on the preliminary information already available, would you say it's more of a gimmick? Or do you think it sounds more like a useful new feature? Your picture really says it all.. Apple Fanboy. Apple phones are good as they are simple, but for productivity like android(HTC and LG, ETC.) Apple is nothing compared to them. 3D touch is nowhere near useful fanboy. I mistakenly thumbed you up :( when trying to replay, anyway since when Apfle invented force touch ?! It was there in the Huawei Mate s before it..
You can remove the thumbs up. Do it now! The Apple Watch had it... Anyways, yeah the Mate S was technically the first phone to utilize it, but you're naive to think that Huawei did it for any other reason than to pre-empt Apple. I have access to all my short cuts and then some by using Pie Control on my Note 3....But I do like what LG has done with the secondary display on this device. They just threw a wrench at my decision for upgrading my Note 3. I had settled on the MXPE after Samsung messed up on the Note 5 with the lack of a microSD slot. I dont think it is gimmick. It will not be much useful but it is not a gimmick. Having icons, music play back, watch and other stuff availabe on the top of a phone is ok. It is just a different placement of some quick stuff, which cannot be considered as gimmick. But I have a question about the placement. It will be always on the top. I cannot reach it one handed despite having gorilla size hands. Bottom placement of ticker display, might be more easy to access. Anyway, it is ok and acceptable. V10 is the perfect and one of the most practical choice available at the moment. Gimmick but can be useful in some way. to quickly get to things faster. The concept is pretty great. The location, not. The top of the screen on a humongous phone is simply too much. I would have preferred Sony like approach. If you have used a Sony phone, you must know that those small app shortcuts appear whenever you press multitasking button. LG could have placed the shortcut there. I partially agree with you... I wish Sony updates the small apps to be able to make real mini-apps, even some widgets do not work as they should (Google Keep for instance, when you have more than 1 google account)... But the accessibility is great at least for the first 5 Small apps in portrait mode. For me the most useful have been: Browser, Calc, Whatsapp, Music, Photos... And by the way you can install "Shortcut Small App" which can open 1 or many apps when launched... so there you go. Actually besides widgets you can also install third party specific apps and I have one called "Small Shortcuts" that you can use just like what Galaxy Note provides or LG... If you set just 1 app for the Shortcut it will open inmediately, but if you place more than one it will open a floating window with many icons.... Also "Fast App Switcher" from hansip (the best small app developer IMO) also offers a similar floating shortcuts. Yes the placement makes it gimmick. It is useful if it is placed on the bottom. I agree, the location should be at the bottom... but I still consider this to be a gimmick... A phone with an AMOLED screen, and an app such as NoLED is able to display notifications with minimal battery usage and if you configure it properly, you can also launch them directly. Now, comparing it to a regular LCD, yes this might be a bit useful... but with the (slowly) increasing popularity of smartwatch this might be irrelevant in the future. I agree with you, the concept is pretty nice but the placement is little far to access. It will not be convinient to always move your hand to reach the top.